Stocks, Significance Testing & p-Hacking. Follow me on Twitter (twitter.com/pdquant) for more. Over the past 32 years, October has been the most volatile month on average for the S&P500 and December the least, in this article we will use simulation to assess the statistical significance of this observation and to what extent this observation could occur by chance. All code included! Originally posted here. We will be using Daily S&P500 data for this analysis, in particular we will use the raw daily closing prices from 1986 to 2018 (which is surprisingly hard to find so I’ve made it publicly available). The inspiration for this post came from Winton, which we will be reproducing here, albeit with 32 years of data vs their 87 years. For those on Kaggle I’ve created an interactive Kernel — give it an upvote! To answer the question of whether the extreme volatility seen in certain months really is significant, we need to transform our 32yrs of price data into a format that shows the phenomena we are investigating. Our format of choice will be average monthly volatility rankings (AMVR). Now we use one of the more powerful tools in Pandas: Resample. This allows us to change the frequency of our data from daily to monthly and to use standard deviation as a measure of volatility. These are the design choices we have when constructing an analysis. By plotting our AMVR we can clearly see the most volatile month has been October and the lowest, December. Understandably, this is leads to confusion over what test to conduct and how to conduct it. 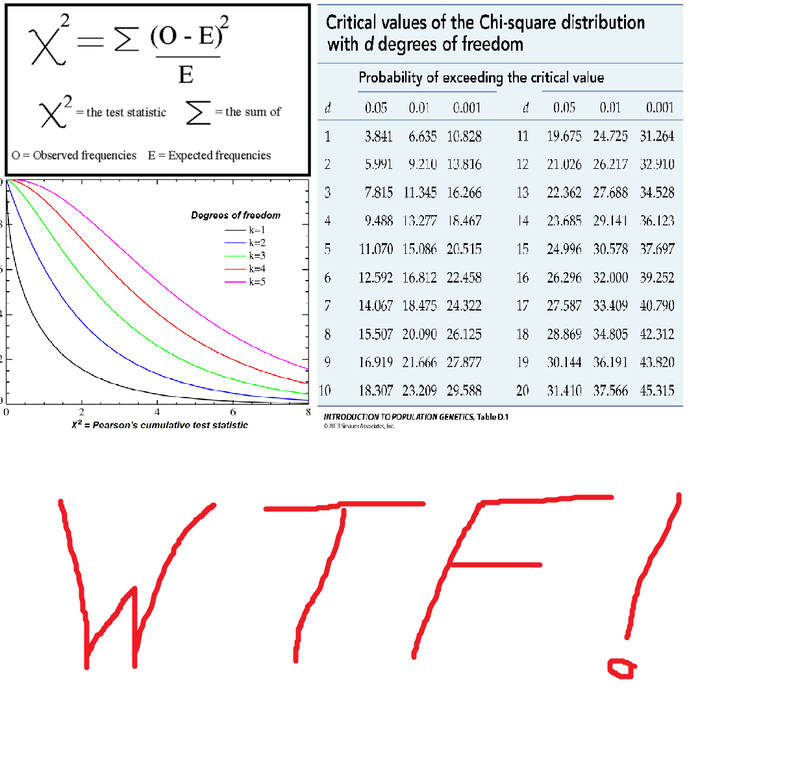 However, all of these classical statistical techniques for performing a hypothesis test, were developed at a time when we had very little computing power and were simply closed-form analytical solutions for calculating a p-value,that's it! But with the added complication of needing to pick the right formula for the given situation, due to their restrictive and sometimes opaque assumptions. We wish to test “whether the observed effect in our data is real or whether it could happen simply by chance”. Choose an appropriate ‘test statistic’: this is simply a number that measures the observed effect. In our case we will choose the absolute deviation in AMVR from the mean. Construct a Null Hypothesis: this is simply a version of the data where the observed effect in not present. In our case we will shuffle the labels of the data repeatedly (permutation). The justification for this is detailed below. Example: The left plot shows the true data and the observed effect with a certain probability (green). The right plot is our simulated null data with a recording of when the observed effect was seen by chance (red). This is the basis of hypothesis testing, what is the probability of seeing the observed effect in our null data. #take absolute AMVR from the mean, we see Dec and Oct are the biggest absolute moves (Oct to the upside, Dec to the downside), with Dec being the greatest. Parametric models. If we had a good idea of the data distribution or simply made assumption on it, we could use ‘classical’ hypothesis testing techniques, t-test, X², one-way ANOVA etc. These models can be restrictive and something of a blackbox if their assumptions aren’t fully understood by the researcher. Direct Simulation. We could make assumptions about the data generating process and simulate directly. For example we could specify an ARMA time series model for the financial data we are modeling and deliberately engineer it to have no seasonality. This could be a reasonable choice for our problem, however if we knew the data generating process for the S&P500 we would be rich already! Sampling is a big topic but we will focus on one particular technique, permutation or shuffling. To get the desired null model, we need to construct a dataset that has no seasonality present. 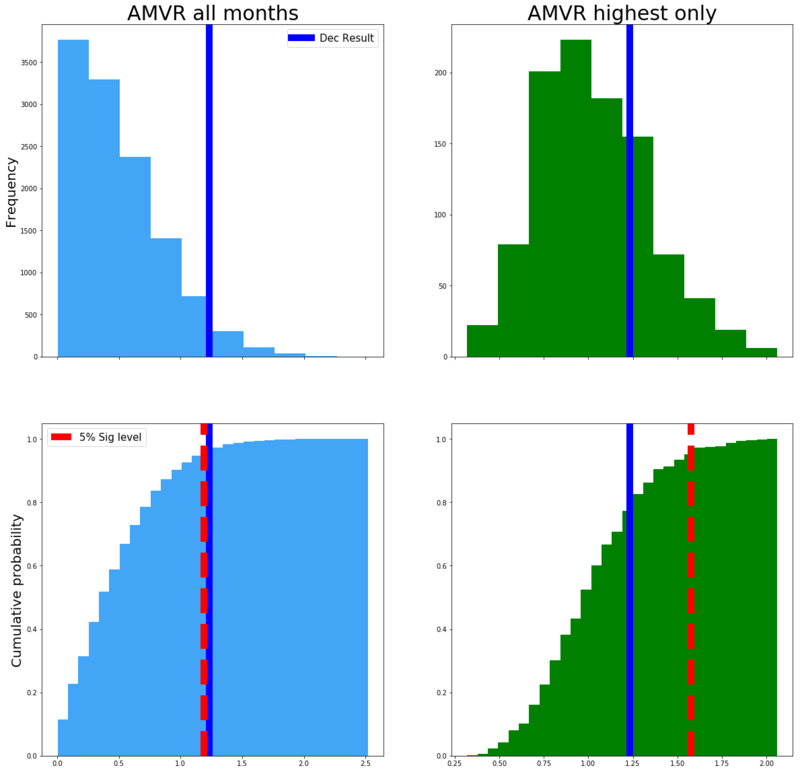 If the null is true, that there is no seasonality in the data and the observed effect was simply by chance, then the labels for each month (Jan,Feb etc) are meaningless and therefore we can shuffle the data repeatedly to build up what classical statistics would call the ‘sampling distribution of the test statistic under the null hypothesis’. This has the desired effect of making the observed phenomena (the extreme December value) equally likely for all months, which is exactly what our null model requires. To prove how powerful simulation techniques are with modern computing power, the code in this example will actually permute the daily price data, which requires lots more processing power, yet still completes in seconds on a modern CPU. 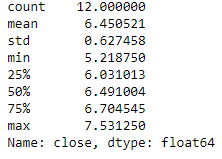 Note: shuffling either the daily or the monthly labels will give us the desired null dataset in our case. Note: The way our test is constructed is the equivalent of a two sided test using ‘classical’ methods, such as Welch’s t-test or ANOVA etc, because we are interested in the most extreme value, either above or below the mean. These decisions are design choices and we have this freedom because the Null Model is just that, it’s a Model! This means we can specify its parameters as we choose, the key is to really be clear what question we are trying to answer. #as our Null is that no seasonality exists or alternatively that the month / day does not matter in terms of AMVR, we can shuffle 'date' labels. Here’s the interesting bit. 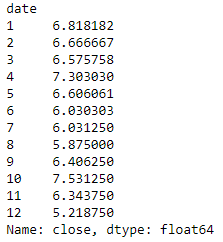 We’ve constructed a hypothesis to test, we’ve generated simulated data by shuffling the ‘date’ labels of the data , now we need to perform our hypothesis test to find the probability of observing a result as significant as the December result given that the null hypothesis (no seasonality) is true. Whats the probability of seeing at least one significant result given a 5% significance level? 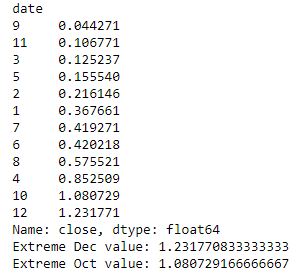 Now lets ask, for each individual test (comparing each of the 12 months absolute AMVR to the mean) how many significant values should we expect to see amongst our random, non-seasonal data? So with a 0.05 significance level we should expect a false positive rate of 0.6. In other words, for each test (with the null data) comparing all 12 months AMVR to the mean, 0.6 months will have show a significant result. (obviously we cant have less than 1 month showing a result, but under repeat testing the math should tend towards this number). This is an example of multiple comparison bias. Where we have expanded our search space and increased the likelihood of finding a significant result. This a problem because we could abuse this phenomena to cherry pick the parameters of our model which give us the ‘desired’ p-value. This is the essence of p-hacking. This xkcd nicely highlights the issue with multiple comparison bias and it’s subsequent abuse, p-hacking. Now lets plot these distributions. rarily decided upon. The blue line is the original extreme December AMVR value of 1.23. The left side plot shows that the original December value is significant at a 5% level, but only just! However, when we account for multiple comparison bias, in the right hand plot the threshold for significance moves up from around 1.2 (abs AMVR) up to around 1.6 (see the redline). By accounting for multiple comparison bias our December value of 1.23 is no longer significant! We have learnt that hypothesis testing is not the big scary beast we thought it was. Simply follow the 3 steps above to construct your model for any kind of data or test statistic. We’ve show that asking the right question is vital for scientific analysis. A slight change in the wording can lead to a very different model with very different results. We discussed the importance of recognizing and correcting for multiple comparison bias and avoiding the pitfalls of p-hacking and showed how a seemingly significant result can become non-significant. With more and more ‘big data’ along with academic pressure to produce a research paper with ‘novel’ findings or political pressure to show a result as being ‘significant’, the temptation for p-hacking is ever increasing. By learning to recongise when we are guilty of it and correcting for it accordingly we can become better researchers and ultimately produce more accurate and therefore actionable scientific results! Authors Notes: Our results differ slightly from the original Winton research, this due in part to having a slightly different data set (32yrs vs 87yrs) and they have October being the month of interest whereas we have December. Also they used an undisclosed method for their ‘simulated data’ whereas we have made explicit, through code our methodology for creating that data. We have made certain modeling assumptions through out this work, again, these have been made explicit and can be seen in the code. These design and modeling choices are part of the scientific process, so long as they are made explicit, the analysis has merit. Hope you found this useful and interesting, follow to be notified with my latest posts!